You will earn 4,427 Reward Points. Earn 1 reward point for every 1 dollar spent. The Kolpak P6-054-CT Walk-In Cooler is a versatile and durable indoor/outdoor remote unit with a .100 smooth aluminum floor and a 26 gauge embossed galvalume interior and exterior. Using a 1/3 horsepower top-mounted condenser, the contents of your cooler remain at a medium temperature of 35 degrees Fahrenheit. There's even a 2.5" dial thermometer so you can keep consistent track of temperatures. This unit is 78 inches tall, 58.50 inches wide, and 47 inches deep. Polar-Pak can easily be installed in practically no time at all without the services of a refrigeration technician or plumber. Corners, wall panels, and doors are quickly assembled on the unit's floor (or screeds), and the ceiling panels lifted into place. Then the self-contained wall-mount refrigeration unit, equipped with caster for leveling, is simply rolled up and fitted into place. The top mount system is shipped ready to fit into the appropriate ceiling panel and is simply lifted into position and then bolted into place. Wiring the refrigeration system can be as simple as attaching a pigtail and plugging the unit into the wall. No drain line is required for indoor installations - making Polar-Pak ideal for basements and upper-floor applications. If you do not see a specific Kolpak product, please call 1-800-555-0666 and our Sales Consultant will be able to assist you. Thank you. Polar-Pak coolers and freezers are made with the same rugged, high-performance construction that has to make KOLPAK the leader in walk-in refrigeration. The Polar-Pak modular panels of 4" 100% foamed in place non-CFC urethane foam offers superior insulating capabilities. The exterior and interior of top-quality galvalume. The Polar-Pak also offers superior air circulation around the coils making it both economical and efficient to run. Self-evaporating compressor technology eliminates the need for a plumber or plumbing equipment. Side mounted unit compressor comes on casters so there is no heavy lifting for our valued customers. Polar-Pak is flexible enough to be used in virtually any configuration. There's no need for numbered panels. Side mount refrigeration systems can easily be set into any of the unit's 46" wide wall panel locations. Unit Coil is level with the ceiling, thus providing more storage area and preventing accidental damage to the fan. Lower cost polystyrene insulation has a low R-Factor (insulative rating).The polystyrene insulated unit will not hold temperature as effectively as the high quality foamed in place urethane used in Kolpak systems. In fact, a Kolpak unit may operate as little as half the time and still maintain temperature. This translates into substantial electrical savings and reduced wear and tear on the refrigeration system. The payback for the additional cost should be realized in as little as 6 months to a year.The Kolpak "foamed in place" construction process involves blowing high-density urethane foam into a block of pre-constructed heavy gauge panels. Polystyrene insulated units are manufactured by simply laminating (gluing) the outer metal skin onto foam blocks which have been known to delaminate after time. Think twice before purchasing these units as they do not pay in the long run. Kolpak manufactures custom components for their refrigeration systems that are oversized and are more productive. These systems are tested to function in ambient temperatures as high as 120 degrees. Most other manufacturers test at 90 degrees. Additionally, more than any other component in your operation, refrigeration systems are highly sensitive and may require more service. It's comforting to know that Kolpak has authorized service agencies throughout the country and can respond speedily when required. The old axiom, "You get what you pay for" surely applies here. We recommend including liftgate at check out if you don't have a dock or forklift. For lift-gate delivery please specify at check out. Cooler/freezer Combinations are available using listed compartment sizes. 30" and 34" wide doors. Contact factory for additional options and accessories. With the Kolpak P6-054-CT Walk-In Cooler, you can move around with ease and store refrigerated items quickly and efficiently. 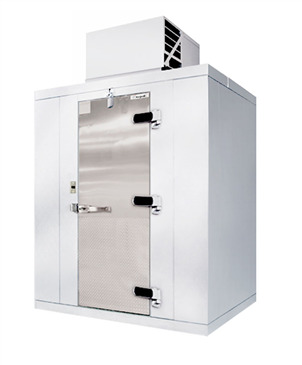 This Kolpak P6-054-CT Walk-In Cooler also comes with a top mounted/ceiling mounted compressor. This aluminium cooler is 78 inches tall, 58.50 inches wide, and 47 inches deep. I use this daily in my restaurant and I couldn't have found a better price for this walk-in.